Water, a membrane with a tiny hole and a small metal plate: that's all that is required to generate a voltage of 20,000 volts. 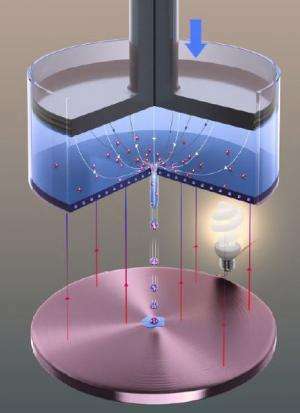 Researchers from the University of Twente MESA+ research institute have developed a completely new type of electrostatic generator that is able to directly convert the kinetic energy from small ejected droplets into electrical energy. At almost fifty per cent, the conversion efficiency of the system is extremely high. The leading scientific journal Nature Communications publishes the research today. The electrostatic generator developed by researchers from the University of Twente has an extremely simple design. The system consists of a water container with a membrane containing a micro-hole at the bottom. The water pressure ensures that tiny water droplets are forced through the hole in the membrane and then ejected. Because the membrane is negatively charged, the droplets are given a positive charge. The charged droplets land on a small metal plate that is increasingly positively charged. Finally, the droplets are brought almost to a complete halt due to the repulsive force of the metal plate. In the process, the kinetic energy of the droplets is converted almost entirely into electrical energy. With the generator, the researchers were able to generate a difference in voltage of 20,000 volts. By fixing an extra negatively charged metal plate under the membrane, it proved possible to reduce the difference in voltage to the much more practical value of 500 volts. Electrostatic generators have existed for many centuries. The Van de Graaff generator from the early twentieth century is probably the most famous one. The generator that has now been developed at the University of Twente, however, works in a completely different manner from existing electrostatic generators. The latter invariably move the charge by mechanical means, such as with a rubber belt, while the new generator does this by ejecting the charge at speed. The conversion efficiency of the system, at almost fifty per cent, is as a result extremely high, and the design is very simple. The system is also easy to scale up by using a membrane with a lot more holes. The generator does not yet have any specific applications, but could be used, for example, to separate chemical or biological components in a mixture on a lab-on-a-chip, a tiny laboratory on a chip. Seen the idea before... those guys should have done a little bit of research in the so called 'free energy' sites on the net. This idea has been around for a long time.